Hi.... I have paid for an up grade to get virus protection but cannot get to the page to enter the code given. I am running the free version. Help! If you run the update and let it download all available updates first, the option to enter the license will appear. Might require a restart unless you close Start Center while updating. Simply click on the "Free Edition" in Start Center, and the opening license dialog will have the button to enter the license key. To retrieve your key if it has gone missing along with the license installer. Yeah, where exactly though. Because I've uninstalled, reinstalled, and updated, and still no option to change from free version. Am I just an idiot? Or what did I do wrong here. Feel like simply upgrading a program should be a bit more intuitive than this. Open the Start Center and click Show details in the lower right corner. Click the Free Edition (or whatever your current Edition is) text below the logo to open the license overview window. In the license overview window, open the Your License tab and click the Enter a new License Key button. 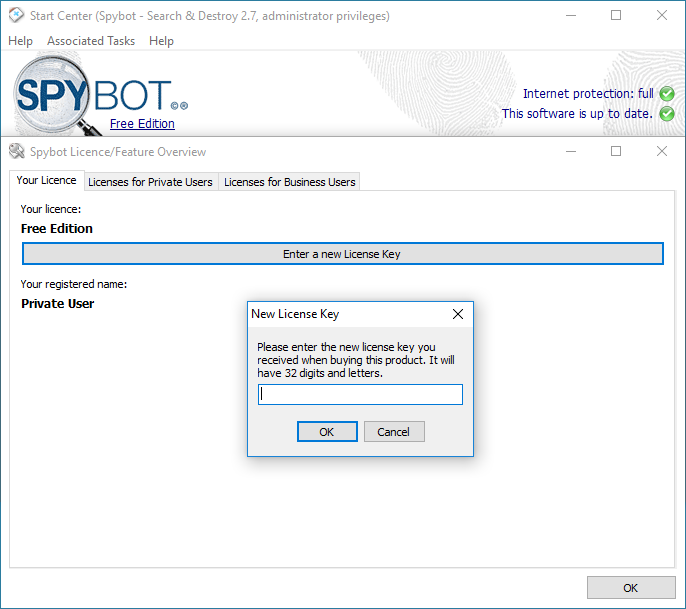 If you do not see the Enter a new License Key button, you must download and install the latest Spybot updates. See Why Cant I See the “Enter a new License Key” Button? Enter the license key you received (it can be found either on the Purchase Confirmation page, your Purchase Receipt email, and your invoice PDF) and you're ready to go. Got it figured out, thanks so much for the help. Appreciate it.